At this point, when we are all witnessing the overall presence of digital marketing, we can no longer neglect the importance content marketing has. It has become a fundamental part of any digital marketing strategy. It is a pillar supporting all your efforts and attempts to position your brand on the market and achieve your business goals. No longer can a business be successful and establish a relationship with the target group without some type of content involved. It all started back in the 1990s. 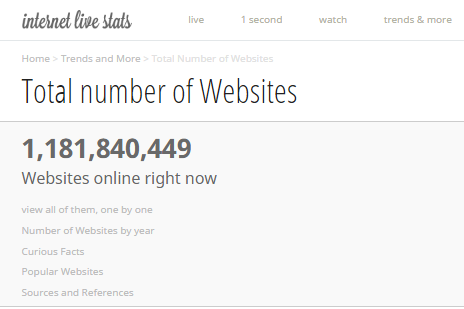 The internet was just kicking off, there were fewer people online. In fact, it has been estimated that there were 100,000 websites in total in January of 1996, as opposed to 1.1 billion websites we have today (Source). This was the time when even Google was still an idea and it was not even possible to imagine writing a status update or chatting with your social media followers. In his essay “Content is the King”, back in 1996, Bill Gates explains the role of content in the modern world, and how the internet is changing the way we create, publish, distribute, and consume content. He predicts that the internet as a medium, which was then something new and different, will revolutionize the way people get information and the way they communicate. This was only an introduction to what was to happen in the subsequent years. As the internet spread all over the planet, so did the content as one of the ways to reach online users, to interact, attract, and sell. It started with websites presenting their business with a couple of web pages. This sort of static web presentation was then outdated, and the need to be more dynamic in communicating with the target group emerged. In the past, you could create a website and sit back, waiting for people to contact you. However, this approach is so obsolete nowadays, that in fact, it would produce zero results. Today, it is expected from website owners to be active, to keep posting fresh information and to keep introducing new content. This is why a lot of websites have a blog. A blog is now a way to keep this dynamic approach, to be active and to make sure that new content is published regularly through this type of platform. Benefits of this approach are numerous, starting from gaining traffic, positioning for specific keywords to expanding reach through social media shares and obtaining new leads. There is no doubt that the role of content has evolved over the years, but so have the content types and production processes. Written content has evolved with new styles taking over, but the usage of visual content is also gaining importance, especially in the last few years. The concept of storytelling was also introduced as a more elaborate content strategy. The more content there is, the more important it is for the content to be extraordinary. It is as simple as that. There are so many websites online and so much content published each day, that it has become very difficult to make content that really stands out. To be successful at content marketing, you need to go beyond content creation and think about management and optimization as well. With sophisticated search engine and social media algorithms, as well as email spam filters, content distribution is also facing some challenges. As the content has found its application in all parts of online marketing, developing a content marketing strategy has become an essential task and it is something that needs to be conducted very carefully with right goals in mind. Producing engaging content and producing content consistently are some of the most common challenges for marketers. Yet, these are the top priorities for most marketers because this is the road that brings success with content marketing strategy.